There’s *almost* a new mural on the block! 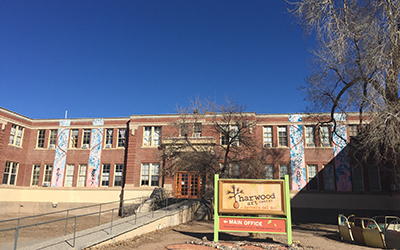 In the last few years, Harwood has been honored to have installations and murals adorn our main building. In 2015, Hand Eye Collective (members Christopher Blaz, David Cudney, Joel Davis, Mandy Hanks, Lance Ryan McGoldrick and Casey Warr) created “Immiscible Polarity.” Last year Nani Chacon created a wheat paste mural, “An Homage to Wells Park,” that blanketed the brick of the building with images of tattoos from people in the neighborhood. This year, Reyes Padilla and Natalie Voelker are going to continue the tradition of murals on Harwood’s facade with the installation of “La Joya 2017.”When our Chief Programs Officer, Julia Mandeville, saw a collaborative piece Reyes and Natalie completed at a community member’s home, she was in awe of their work and wanted to bring the same magic they had created to Harwood. This birthed the idea of having the two create a large-scale mural for the Harwood. Reyes and Natalie have collaborated on a few projects together, but the mural at Harwood will be their largest collaborative work to date. The two artists have very different styles of work. Natalie’s art > is primarily figurative and expressive, while Reyes’ > is more abstract with flowing lines. Although their work is very distinct, the combination of their styles is impactful. When deciding what to do for the Harwood mural, Reyes and Natalie knew they wanted to do a painted mural, as they both work most often with paint. Painting directly on our historic building is not an option, so the artists decided to paint on panels ahead of time and install them onto the building. When installed, the panels will emphasize the vertical lines of the building. The background of the panels is painted with soft pinks, peaches, and blues—reminiscent of clouds in an Albuquerque sunrise. Natalie spent many additional hours with the girls’ school “La Joya” yearbooks. She chose images of four young women to include in the mural. She imagined each figure she chose to have a strong individual story, even though the exact history of each figure is not known. The viewer can, however, imagine the figure’s story—what she might have liked or some of her personality traits—through viewing. These four figures are rendered near the base of the painted panels. Emanating from the figures, the viewer will see Reyes’ line work—black and white painted lines that dance and radiate above. This part of the mural represents the energy of the figures and the presence these women still have, even though they no longer physically reside at Harwood. Reyes and Natalie are currently finishing the last of the panels for “La Joya 2017.” The mural panels will be installed from Friday, February 24 through Thursday, March 2, dedicated at our Encompass event on Saturday, March 4 and live on the building for up to a year. “La Joya 2017” is a beautiful homage to the women of Harwood Girls School and serves as a reminder of the rich history here at Harwood. It celebrates the spirit of this special place that is now Harwood Art Center.